The Junior Eagles club began operating shortly after Sheffield Eagles joined the Rugby Football League in 1984. The Junior Eagles developed into Sheffield Hillsborough Hawks which over the years has introduced many young people to Rugby League. The Development work in the City has, unfortunately, not unearthed any International stars but a number of young men, who got their first taste of Rugby League through the Sheffield Eagles Development work or by their involvement with Hillsborough Hawks, have gone on to play professional Rugby League. 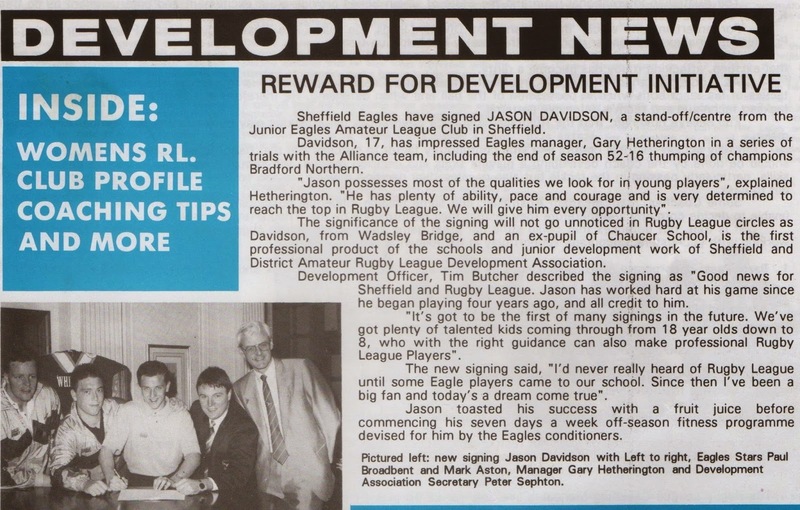 This article about the first Sheffield born player to sign for the Eagles appeared in the Rugby League Development News in August 1991.